APassGen is a random password generator written specifically for the Agenda VR3 PDA ( Agenda Computing ). APassGen uses the FLTK library, and is released under the BSD license. In addition, APassGen can generate pronounceable passwords along with a guide to the pronunciation. It can save your configuration to a file so that your defaults are retained between sessions. A binary built for the Agenda is included along with the source code. APassGen is written by me ( Peter Knowles <peter@knowleshome> ). 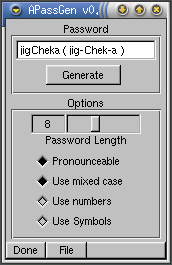 It uses code from APG written by Adel I. Mirzazhanov for the password generation routines. Any suggestions or comments ( or patches, if you are so inclined ) are welcome.